The Indonesian pharmaceuticals sector value added grew 7.1% in 2017, and in 2018 an increase of about 7.5% is expected, driven by a rising population and roll-out of the government's universal healthcare insurance system, which will expand access to medicine and healthcare. Foreign pharmaceutical businesses dominate the market for patented drugs, and have invested more than USD 1 billion to build factories and in clinical research. However, foreign players continue to face significant competition from domestic companies like Kalbe Farma, Tempo Scan Pacific and Kimia Farma. Those local firms are well established with significant activity across various subsectors, including logistics, consumer healthcare and prescription drugs. Due to the recent currency depreciation we expect the profit margins of manufacturers to deteriorate in the coming months, as a large percentage of raw materials for pharmaceutical production has to be imported. However, the impact should be partly mitigated by higher sales prices. In general, banks are willing to lend to the sector due to the positive performance trend and growth prospects. Gearing tends to be generally lower in manufacturing, but higher in the distribution segment, due to working capital purposes. On average, payments in the Indonesian pharmaceuticals sector take 30-60 days. The number of non-payment notifications and insolvencies was low in 2017, and no substantial increase is expected in 2018. Due to this and the favourable growth prospects our underwriting approach to the pharmaceuticals sector is generally positive. Our underwriting stance for the basic chemicals and petrochemical subsectors is neutral. Petrochemicals has developed only slowly in recent years, with most players lacking value chain integration (i.e. operating in either the upstream segment or the downstream segment only). 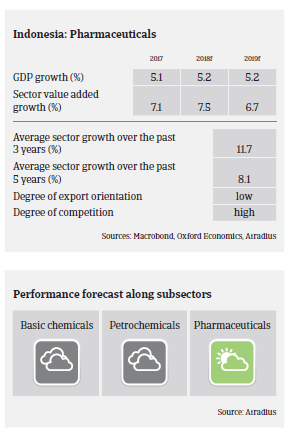 While basic chemicals show stable growth rates (mainly driven by construction, automotive, increased urbanization and a growing middle class), inefficiencies and red tape remain stumbling blocks.